April has turned to May and with Mother’s Day just around the corner, it is an obvious time to reflect on motherhood. My oldest turned 10 years old last week and I’m suddenly surprised that I’ve been doing this for that long already. I am just so proud of him and excited about this coming year. I remember those early years of mothering and how hard they felt. Everything was new and uncertain but also fiercely emotional. It’s not as new anymore and it’s easier to trust my parenting instincts as the years go by. I’m so thankful for all the moms that I’ve had in my life to help light the way. Friends who listened and talked me through sleep deprivation, picky eating (I talked a lot about this one), and new schools. I firmly believe that raising humans is the hardest, yet most important work of all. Over the years, I’ve learned (or am learning, ahem) that parenting is not about creating a certain outcome but is more about finding out who these little humans are and helping them along the way. They are not my mirror and so they do not necessarily reflect me. Yet, I am responsible as well to ensure that they get all that they need so that they can grow up and continue the cycle. So lets celebrate motherhood and our own mothers for the blood, sweat, and tears that were poured into us and that we in return are pouring into our own children. This Mother’s Day is extra special because my mom is going to be traveling across the country to visit and will be here to celebrate with us. As I was thinking about what I wanted to make for her, as well as for my own family, I landed on lemon poppy seed scones. Scones that are flaky yet can hold up to a bit of compote or jam. Scones that announce that spring is here. Scones that can be eaten slowly over a cup of coffee. These ones fit the bill. The tangy lemon combined with the nutty crunch of poppy seeds keeps me coming back for more. I find many lemon poppy seed recipes to be a tad fussy (syrups and glazes) and so I love the simplicity of this recipe. I especially like the sparkling sugar that gives a nice sweet contrast. I used lemon extract that was given to me by Ballard Extracts, and I have to say, that I really like how the extract worked to let the poppy seeds share in the lime light. Rhubarb grew in our back yard growing up and I remember eating it raw right after pulling up a stalk. 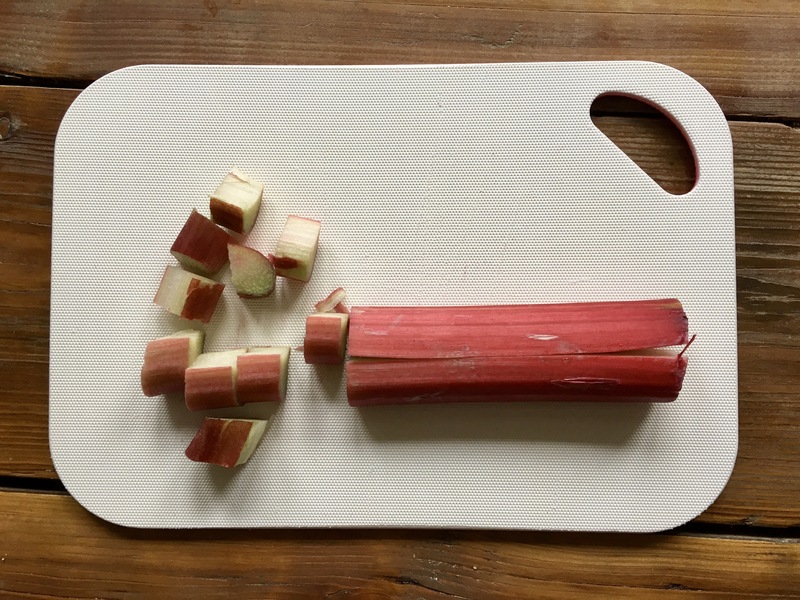 Rhubarb has a delightful sour taste that reminds me of grapefruit and has a texture similar to celery. It breaks down quickly when cooked and the pretty jeweled tone is a beautiful complement to the sparkling scone. I couldn’t stop dipping my scone in the compote so I finally just cut the scone in half and layered half with butter and compote. I would suggest doing the same! Adapted from Smitten Kitchen’s Dreamy Cranberry Scones. 5 tablespoons unsalted butter. Remove from refrigerator and cut into cubes right before incorporating into mixture. Preheat the oven to 400° degree Fahrenheit and cover a baking sheet with parchment paper. In a dry non-stick skillet, toast the poppy seeds on medium for a few minutes until they smell nutty. Remove to a small bowl and allow to cool. This is important because you don’t want warm poppy seeds to melt the chilled butter. In a large bowl, whisk flour, baking powder, sugar, salt and cooled poppy seeds. Using fingers, rub butter into flour mixture until the flour looks like sand and stays together when squeezed. Work quickly so as not to warm up the butter too much. I like to stick the bowl in the refrigerator for 10 minutes or so to firm up the butter before moving on to the next step. Mix lemon extract into heavy cream and pour into flour. Use a wooden spoon and mix. You will have a shaggy dough. Dump out on a clean counter top and knead 2 or 3 times to bring the dough together. Flatten dough into a 8 in circle. Use a bench scraper to even out the edges. The circle should be about 1/2 inch thick. Transfer to the baking sheet. Cut into 8 triangles. Brush with heavy cream and sprinkle sparkling sugar on top to your hearts desire. Bake for 15 minutes, rotating once for even baking. The scones are done once a toothpick comes out clean and the scones are golden brown. Cool on a wire rack. Scones are best eaten the same day, but you can freshen them up in the oven for a few minutes the following day or keep scones refrigerated over night and bake off the next mirning. You will need a few extra minutes for baking if refrigerating over night. Adapted from Food52.com. I love this compote and along with slathering it on a scone, it is also lovely swirled into yogurt. You won’t want to skip it! Feel free to adjust the amount of sugar to your tastes. I found 1/3 cup to be right for me but you can start out with a 1/4 cup and adjust from there. Melt butter in a small saucepan on medium low. Add rhubarb, sugar, salt and vanilla. Stir to combine and continue to stir to keep sugar from burning. The rhubarb and sugar will create a syrup on the bottom and bring to a simmer. Simmer and stir for 10 minutes. The rhubarb will soften and you will begin to smell the happy scent of the sour and sweet rhubarb. Take the compote off the burner once the rhubarb has softened and the compote is mostly smooth, with only a few chunks remaining. Cool and refrigerate. Serve on the side.